Love this song and the beautiful people of Israel! This is what the 2016 Pride Parade was like in Tel Aviv. Many Israelis are raised with values that inspire them to give back not only to their communities, but to people around the world. Jews have a nearly 4000 year connection to the land of Israel, but the birth of political Zionism emerged in a specific context. With leaders such as Theodor Herzl at the helm, Jews took the dream of creating Israel and made it into a reality! This is a good report about the successes of the Israeli LGBTQ community, as well as the challenges they still face. Alan Dershowitz says that Israel should have turned its Declaration of Independence into a Basic Law, arguing that the Nation State bill harms Israel's image. 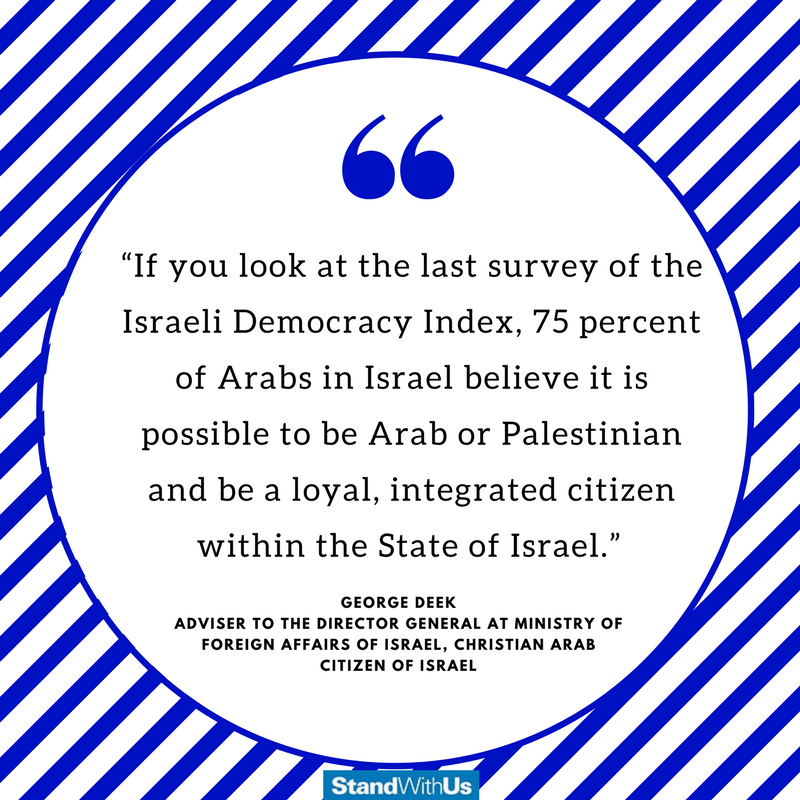 Despite the challenges Arab citizens of Israel face in Israeli society and internal pressure to reject the state, most accept Israel and want to be an active part of its success. Israel’s territory is 8,019 square miles. Israel is smaller than New Jersey in terms of territory. Israel can fit into the state of California 19 times. There's only one Jewish state in the world. There are 67 countries where the majority of the population is Roman Catholic, 49 where the majority is Muslim, 49 where it is Protestant, 14 where it is Eastern Orthodox, 3 where it is Hindu, and only 1 where the majority is Jewish: Israel. Jews are not a large of the world's population. There are 2 billion Christians in the world, 1.6 billion Muslims, 1 billion Hindus, 376 million Buddhists, and 14 million Jews. In 1948, 160,000 Arabs who lived within Israel’s borders accepted Israel’s invitation to choose peace and become Israeli citizens. Israeli laws safeguard religious liberty for all faiths. Fifty-three percent of Israeli women are in the workforce, similar to the percentage in the U.S.
Three Israeli Arabs were elected to the first Knesset (Israeli Parliament) in 1949. There were 17 Arab members elected into the Knesset in 2015. Today, 1.8 million of Israel’s 8 million citizens are Arab. They enjoy the same legal rights as all other citizens. Israel has the highest ratio of trained scientists and technicians with 135 per 10,000 citizens, compared to 81 in the US, over 70 in Japan, and less than 60 in Germany. Israel protects minority rights and actively works to advance social and economic equality. Israeli Arabs have served in the Knesset since Israel’s reestablishment in 1948 and are in prominent government positions. Israeli Arab Christian Lina Makhoul won Israel’s version of “The Voice” in 2013. Arabic-speaking Christians lead Israel academic achievement. In Israel, gender equality is enshrined in law. Women pursue all careers, make up the majority of students in higher education, serve in the military and prominent government positions, and have full reproductive rights and personal freedoms. Israelis have the second-highest number of university degrees per capita in the world. Since 2000, Israelis have won three times more Nobel Prizes per capita in science and economics than the next highest-ranked countries. Israel is the only Middle Eastern country where the Christian population has grown in the last half-century. There are almost 2 million non-Jews in Israel, making up about 25 percent of Israel’s population. Israel is home to many religious minorities and guarantees their right to practice their faith and administer their internal affairs. Arabs have won as many as 13 of the 120 Knesset (Israel’s parliament) seats in a single election. Arab-Israelis are the largest minority group in Israel and are active in all facets of Israeli life. Though Ethiopian Israelis face many challenges, their community has also achieved remarkable things. For example, while the high school graduation rate among those who moved to Israel at an older age is only 36%, Ethiopian Israelis who grew up in Israel now graduate at a rate of 90%. Tech-Career is an Ethiopian Israeli non-profit, which empowers members of the community to enter Israel's thriving high tech industry. According to Rolling Stone, "over the past 50 years, Israel has become the epicenter of medical pot." What is a Basic Law? This article argues that Israel's Nation State Law was necessary in light of all the forces which seek to deny Israel's right to exist as a Jewish state. In Israel, the LGBTQ and Orthodox religious communities are often in conflict. However, there are a significant number of Orthodox rabbis in Israel promoting tolerance. In 2018, the Israeli LGBTQ community held the largest Pride Parade in Jerusalem's history with over 20,000 people attending. In 2018, Israel's LGBTQ community organized a large protest against a government decision regarding surrogacy rights and received backing from Israel's main labor union and many of its largest companies. Interested in the 2019 Israeli elections and Israeli democracy in general? Take this fun quiz to see which Israeli political party you align with, and check out the other educational resources on the page. This is an interesting look into the Syrian military outposts and civilian structures that remain in the Golan Heights. Syrian forces used the high ground to attack Israelis living in the valley below, until Israel took control of the territory in 1967. While most of the Druze population living in Israel are proud Israeli citizens who serve in the IDF, the situation of Druze who live in the Golan Heights is more complicated. According to a poll conducted after the 2019 elections, 2/3 of Israelis support a center-right government with Likud and Blue & White joining forces rather than a more right wing government featuring ultra-Orthodox parties. It may seem like an unlikely arrangement, but when Bedouin choose to participate in Israeli elections they often vote for Shas - a party primarily dedicated to representing ultra-Orthodox Jews from the Middle East. This article explains why. According to a 2019 poll, most Jewish and Arab citizens of Israel view their interactions with each other positively. According to a 2019 poll, 66% of Arabs in Israel identify as Arab or Arab-Israeli, while 33% identify as Palestinian or Palestinian-Israeli. This resource created by A Wider Bridge explores the 2019 Israeli elections from the perspective of the Israeli LGBTQ community.